Amanda and Martin have the most amazing kittens, they are well socialized and have great personalities. The journey was made easy and effortless because of Martin and Amanda. Hi there! I hope all is finding you well and the new year is bringing nothing but the best! I thought I would touch base with and update for you since Ms. Khaleesi has turned 1. She is quite the little lady of our house. There isn't a person that meets her that doesn't walk away having felt touched by her personality and style; she is quite a charmer. :) She has quite a following of enamored fans. 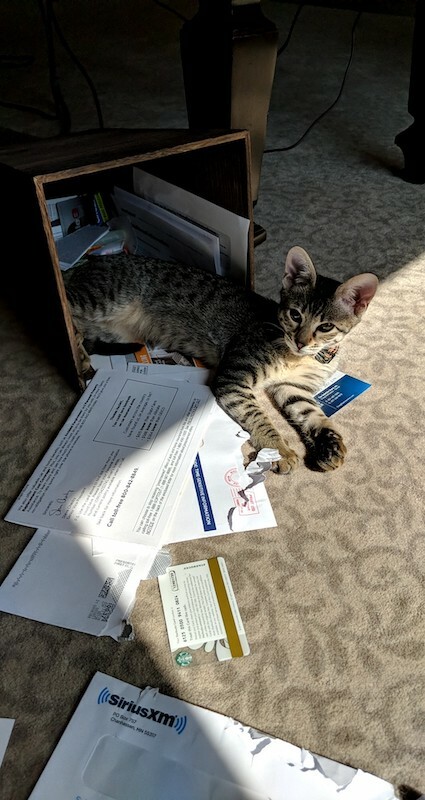 She hasn't slowed down a bit since I wrote back in June (June Testimonial) - She continues to be quite a character - always has something to say, loves a good adventure, and is very inventive when she wants attention. Mischievous as hell to be quite frank. Her latest thing was turning on the touch faucet in the kitchen sink at any hour of the night....I would find her perched on the ledge outside the bedroom door seemingly quite proud of her accomplishment of getting me out of bed - yet again. It seems getting me out of bed is her thing....or if I don't get up she sits on my head. It is her command I awake and it is mine that I don't. It is like a chess game....she makes her move and I make mine....I am on the losing side as she is quite intelligent and inventive. Meanwhile, Tom sleeps through it all - and she is generous enough to let him. She is also training for a marathon I think - She LOVES to run. Always playing NASCAR Kitty through the house and in some cases, I am thinking she is trying to set land speed records. You have to be a bit on alert though, as she loves the additional challenge of racing through your legs when you least expect it. Oh, and don't run away from her backwards....this is just so upsetting - it always results in her attacking my ankles with a good swat and an annoyed meow...I find it hilarious, but she is not joking here. Ms. Khaleesi has continued to be nothing short of amazing. She has great personality and style and rules the roost. She is everything and more than what I have read or expected from a Savannah. I feel pretty lucky to be able to have this experience. Again, hope the new year is bringing nothing but the best! answering all the questions we had. He is my daughter cat, but we are all obsessed with him. She is extremely playful and loves to cuddle with me as well as the others! She holds her own when it comes to wrestling and is also extremely friendly to any visitors. Thank you for bringing us into your Savannah family. It has been our pleasure getting to know each of you. WE WILL BE FOREVER GRATEFUL TO YOU FOR SENDING US " PURE HAPPINESS "! The socializing they do with the kittens is amazing! They are always ready and willing to discuss any questions we have regarding our kitties. Everyone had to have such a little friend in their lives, was the best thing we did as we took him to create as our son! !